This page is about MAGIX Audio Cleaning Lab 15 deluxe Download version 10.0.2.0 (UK) for Windows. Here you can find details on how to remove it from your PC. It was coded for Windows by MAGIX AG. More information on MAGIX AG can be seen here. The program is frequently located in the C:\Program Files\MAGIX\ACLab15_deluxe_Download_version directory. Keep in mind that this location can vary depending on the user's preference. The full command line for removing MAGIX Audio Cleaning Lab 15 deluxe Download version 10.0.2.0 (UK) is C:\Program Files\MAGIX\ACLab15_deluxe_Download_version\unwise.exe. Note that if you will type this command in Start / Run Note you may get a notification for administrator rights. MAGIX Audio Cleaning Lab 15 deluxe Download version 10.0.2.0 (UK)'s primary file takes about 11.62 MB (12185600 bytes) and its name is CleaningLab.exe. MAGIX Audio Cleaning Lab 15 deluxe Download version 10.0.2.0 (UK) contains of the executables below. They take 55.05 MB (57719232 bytes) on disk. The information on this page is only about version 10.0.2.0 of MAGIX Audio Cleaning Lab 15 deluxe Download version 10.0.2.0 (UK). 2. Start Advanced Uninstaller PRO. It's recommended to take your time to get familiar with the program's design and wealth of functions available. Advanced Uninstaller PRO is a very good PC management program. Safety rating (in the lower left corner). This tells you the opinion other people have about MAGIX Audio Cleaning Lab 15 deluxe Download version 10.0.2.0 (UK), from "Highly recommended" to "Very dangerous". 7. Press the Uninstall button. A confirmation window will appear. accept the removal by pressing the Uninstall button. Advanced Uninstaller PRO will uninstall MAGIX Audio Cleaning Lab 15 deluxe Download version 10.0.2.0 (UK). 8. After uninstalling MAGIX Audio Cleaning Lab 15 deluxe Download version 10.0.2.0 (UK), Advanced Uninstaller PRO will offer to run an additional cleanup. Press Next to proceed with the cleanup. All the items that belong MAGIX Audio Cleaning Lab 15 deluxe Download version 10.0.2.0 (UK) that have been left behind will be detected and you will be asked if you want to delete them. 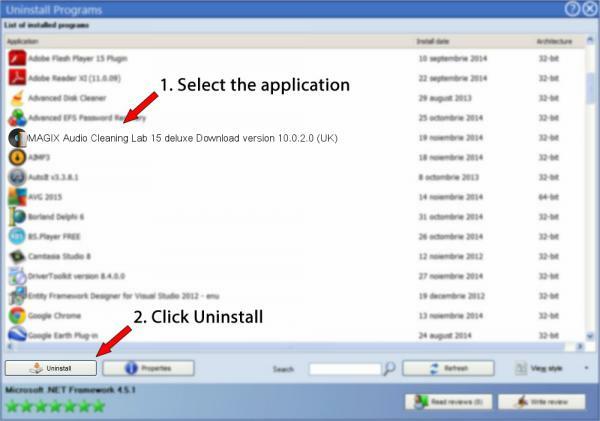 By uninstalling MAGIX Audio Cleaning Lab 15 deluxe Download version 10.0.2.0 (UK) using Advanced Uninstaller PRO, you can be sure that no registry items, files or folders are left behind on your computer. This page is not a recommendation to remove MAGIX Audio Cleaning Lab 15 deluxe Download version 10.0.2.0 (UK) by MAGIX AG from your computer, we are not saying that MAGIX Audio Cleaning Lab 15 deluxe Download version 10.0.2.0 (UK) by MAGIX AG is not a good software application. This page only contains detailed instructions on how to remove MAGIX Audio Cleaning Lab 15 deluxe Download version 10.0.2.0 (UK) supposing you decide this is what you want to do. The information above contains registry and disk entries that our application Advanced Uninstaller PRO discovered and classified as "leftovers" on other users' computers.